This Caprese salad substitutes tomato for watermelon. Photo and recipe courtesy Watermelon.org. 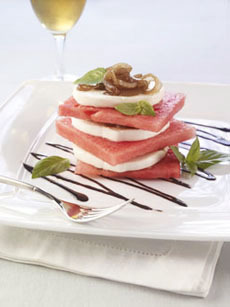 This variation of the popular Italian Caprese salad uses watermelon instead of tomatoes. It adds a garnish of sweet caramelized onions sautéed in balsamic vinegar to complement the traditional vinaigrette of balsamic vinegar and olive oil. Thanks to the National Watermelon Promotion Board for this innovative recipe for a delicious, light summer salad or first course. *Mozzarella di bufala is made from the milk of the Asian water buffalo, which is no relation to the American bison, which is erroneously called a “buffalo.” Water buffalo are members of the same animal family and subfamily as cattle (Bovidae and Bovinae), but are a different genus (Bubalus for water buffalo, Bos for cattle). Learn more about the differences. In a large heavy skillet, heat oil over medium-high heat. Add onions and sauté for about 5 minutes until onions are golden in color and slightly toasted. Reduce heat to medium. Add the vermouth and sugar to the pan and simmer until most of the liquid has evaporated. Stir in the balsamic vinegar and sauté another few minutes. Remove from heat and cool. Slice melon and mozzarella. Alternate slices of mozzarella and watermelon on a serving platter on up to 4 individual salad plates. Spoon onion mixture over watermelon and mozzarella slices. Garnish with fresh basil.